But things never quite turn out the way one plans, do they? It rained and husband Philip got so sick he had to be hospitalized. Television coverage was so bad that it got the Jon Stewart treatment. Back in Britain, the BBC (which had terrible production values) saw fit to make a special report exploring commemorative Jubilee vomit bags with an image of the queen. In the special church service to honor the queen, one speaker could not even find the correct page from which to read. While I solidly favor Republic government over Monarchial government, I have to admit that I felt empathy for Elizabeth’s likely embarrassment. It is a rather wonderful painting with the title in the standard catalogue raisonné (e.g. 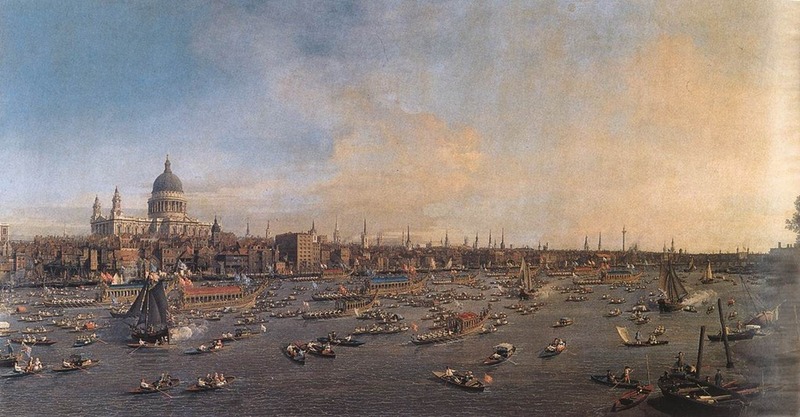 W. G. Constable’s edition) of “London: The Thames on Lord Mayor’s Day, looking toward the City and St. Paul’s Cathedral.” (In several media reports, this painting was described as depicting a royal pageant.) In fact, as part of the Jubilee celebrations, a seemingly rather wonderful exhibition is being held at the National Maritime Museum. I have not seen the exhibition, but only the catalogue, which is a lot of fun. There are six Canaletto paintings and two sketches, and the reproduction of the above picture is over a fold-out spread. The information on Canaletto is somewhat thinner than I might want, but that is made up for by the serendipity of finding so many outstanding paintings, sketches, and photographs of tools, costumes, and other interesting items. It also acts a brief review of the decline of the monarchy from the Tudors to the present day. It is not as academic as I prefer (the guest curator was David Starkey) but it is a handsome volume that I think most would like. It is certainly the nicest item I have seen related to the Diamond Jubilee. For a special interest in Canaletto’s images of the Thames, one is much better off looking at the catalogue Canaletto in England: A Venetian Artist Abroad, 1746-1755, which is ironically an American exhibition from the Yale Center for British Art (the catalogue is published by Yale University Press.) This provides an excellent overview of Canaletto’s time in England, the London Art World of the mid-eighteenth century, and with many details featured. It is simply a stunning book. The best general treatment of Canaletto that I have read is the volume by J. G. Links; which I own in hardcover. This is an older volume (1982) and most of the illustrations are in grayscale, but it has by far the most information on the artist. (Links revised the Constable catalogue raisonné). If you are interested in the Venice period of Canaletto, I can recommend the catalogue from the National Gallery which nicely puts Canaletto into context (the title of the exhibition: Venice: Canaletto and his Rivals.) Alternatively, and somewhat less spectacularly, one can look at the catalogue of the Memphis Brooks Museum exhibit Venice in the Age of Canaletto. But if you just want to look at pretty pictures, the cheapest option is undoubtedly the volume from Phaidon’s Color Library. This latter volume has very nice reproduction, and the images are relatively large, despite its low price. For me, seeing Canaletto’s paintings – even as reproduced in museum catalogues – was far more thrilling than seeing web video coverage of the recent Royal Pageant. Canaletto’s eye was far better in the eighteenth century than the flawed technical production of the BBC cameras in the twenty-first century.